Mick Mulvaney’s budget may terrify its targets. But it’s really just a symbolic sop to right-wing ideologues. The release of the president’s fiscal year 2018 budget today will generate a lot of appropriate outrage from Democrats, advocates for the poor and needy, the states, and even “moderate” Republicans who do not want to be associated with a document that suggests draconian cuts to the social safety net. We know this because the earlier back-of-the-envelope “budget outline” the White House rushed out the door in March, which only covered discretionary spending, a relatively small part of federal budget, was met with a wall of negative noise. And the full plan is much harsher now that entitlement programs like Medicaid, food stamps, and the Earned Income Tax Credit (EITC) are included. A 31.4 percent cut to the Environmental Protection Agency budget, 29.1 percent cut to the State Department, 20.5 percent to Agriculture, 19.8 percent to Labor, 16.2 percent to Health and Human Services, 15.8 percent to Commerce, 13.2 percent to Housing and Urban Development, 12.7 percent to Transportation, and 10.9 percent to Interior. And the document endorses the earlier proposals for shutting down programs and agencies that conservatives don’t like, from federal funding for Planned Parenthood to elimination of the Corporation for Public Broadcasting, AmeriCorps, and the Appalachian Regional Commission. In a huge political gift to opponents of the cuts, the budget also includes a nice chunk of new change for the Pentagon and border wall construction, and the budget “space” to enact Trump’s vast but as yet unspecified tax cuts, mostly aimed at slashing corporate and high-end individual rates. When one veteran liberal advocacy group spokesman called the whole mess “Robin Hood in reverse,” it was with the air of a tennis player returning the highest of lobs. There’s only one catch: Very little of this is actually going to happen. Normally, when Congress is controlled by the president’s own party, as is the case now, you could expect White House budget priorities to be implemented via a budget reconciliation bill imposing the cuts, which cannot be stopped in the Senate by a minority-party filibuster. And indeed, the plan all along had been to pursue this procedure to enact the tax cuts Republicans long for, once Congress was done with the minor housekeeping detail of repealing Obamacare in an earlier budget reconciliation bill. Now, of course, the Obamacare repeal-and-replace process has become a nightmarish slog through a thick jungle for the GOP, and if it can get around to tax cuts before the end of 2017, it will be another very difficult white-knuckle exercise. The very last thing the administration and the Republican congressional leadership will want to do is to make that task immensely more perilous by combining the tasty treat of tax cuts with a lot of unpopular budget cuts. Thus, you can almost certainly expect the administration and the GOP congressional leadership to postpone indefinitely the spending cut agenda. Nothing must get in the way of the sacred tax cuts. So why is the administration going through the motions of releasing a savage and unpopular budget that it really has no intention of implementing? The only answer that makes much sense is that it is a sop to the movement conservatives who really hate the safety-net programs the budget eviscerates, and to the tea-party activists who really do care about levels of federal spending and the size of debt and deficits. 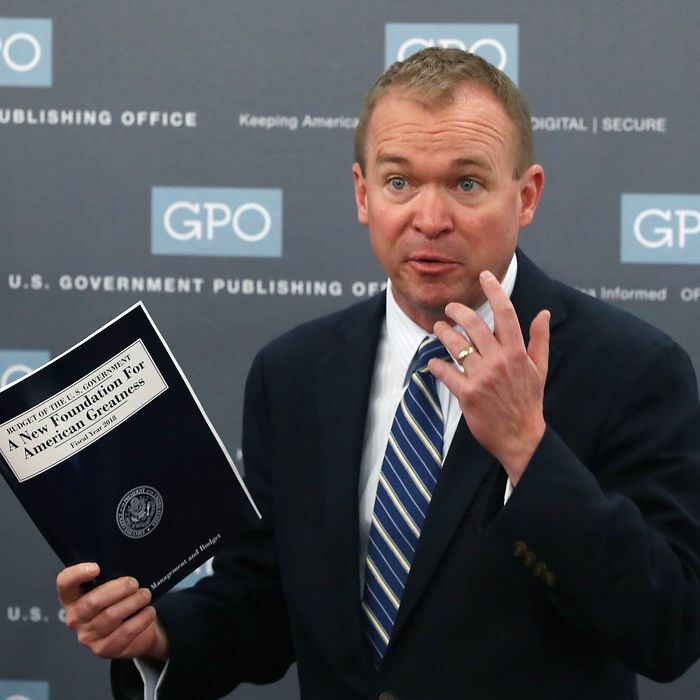 Both factions are, indeed, personally represented by Trump budget director Mick Mulvaney, who put together this monster of a budget document. When the spending cuts go nowhere and are put on some distant back burner so that the real priority of tax cuts can whip through Congress, Trump can shrug and point to Mulvaney’s budget as an indication of what he would have liked to have accomplished had not those evil Democrats and weak-kneed RINOs stopped him. And then the movement conservatives and tea-party activists will have nowhere to go but to try to hold onto Republican control of Congress in 2018, and start the process all over again. It’s all kind of a sick joke. It’s a cynical game the White House is playing. But it’s far less immoral than the budget they have no intention of enacting.